I agree with my master that Scorsese is going to win this year. Martin Scorsese has been making classics for the past three decades and I think that he deserves to be officially recognized. 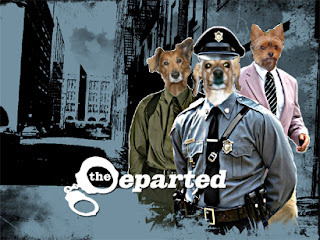 “The Departed”, featuring Matt “Girasol” Damon, Mark “Verdi” Wahlberg and Jack “Buffy” Nicholson is going for the best picture, this film was directed by Scorsese. Like I said before…there is only one choice for Best Director: Martin Scorsese. Estoy de acuerdo con mi amo que Scorsese ganara este año. Martin Scorsese ha estado haciendo clásicos desde hace tres décadas y pienso que él merece ser oficialmente reconocido. “The Departed” protagonizado por Matt “Girasol” Damon, Mark “Verdi” Wahlberg y Jack “Buffy” Nicholson; es candidata a mejor película y fue dirigida por Scorsese. Como lo dije antes…solo hay una opción para Mejor Director: Martin Scorsese. I don't actually know what this Boston accent sounds like, but I guess your analogy says it all. I'm still thinking about Scorsese should win. oh gosh, sorry girasol you didn't get nominated for an oscar. hehehe. Vamos!, Di Caprio, nunca me cayó muy bien...pero si me cambian el reparto por mis perros, Verdi Buffy y tu...Cuenten con mi voto para los oscar!! si señor!!! A mí con suerte me dejan ver la tele y no me llevan al cine porque dicen que me voy a perder en el camino. Si ni DVDs me dejan ver. Dicen que con mis uñas los rayo y que después se ven mal. No oscar, you should have got two. Mira tú Girasol, no sabía que estabas en el cine... Suerte en el Oscar!!! Girasol estas en todas ehh. Jia!! No puedoorrr!! M ha venido automáticamente a la mind un Buffy estilo Nicholson en Mejor imposible, ajaja, ahí todo maníatico pirao de la vida, ajajajajaaj!!! ES cierto, esta película es muuy buena y debería llevarse el Oscar. I am embarrassed to say I haven't seen any of the Oscar nominated movies this year. But I agree with you. Scorsese is due for an award. I am sweet and affectionate! and I have equivalent to ¡27 years human!